The Acro Elves - Donato and Pipa, stars of CBeebies Christmas Carol 2013, are Santa's favourite helpers! They have been left in charge of the workshop by Santa! Their show is an original Christmas treat for all the family to enjoy! Combining physical comedy with acrobatic skills, this colourful and exciting show is perfect to celebrate Christmas! Frayed Knot Circus also known as Edd Muir - For acrobatics of a different sort... Edd performs a Chinese Pole routine that will amaze you and leave you wondering 'how does he do it?' This short 5-6mins routine can be customized to fit into a theme of your choice eg Edd has performed his routine as Mr Cellophane, The Coca Cola Man, Spiderman or even Santa. Available for Theatres, Hotels, Corporate Entertainments any many more event types and venues. 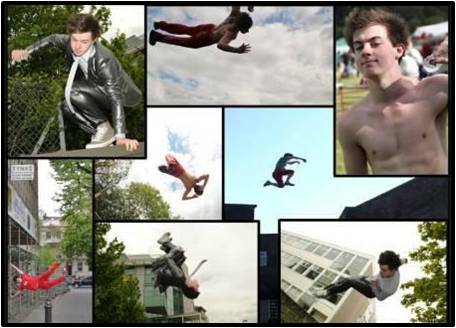 Jordan Wilcox is a Free Runner / Parkour specialist. No stunt is too extreme for this guy. Available for demonstrations, TV, Film, Stunt work, Galas and many more event types and venues. Shoestring Circus also known as Richard Gillett / Professor Seltsam or Ricardo Raspinelli) - performs acrobatics, juggling, mime, balancing skills with or without fire show, or any mix required to suit your audience. Available for Corporate events, Promotional Events, Gala's, Family Fun Days and many more venues and events. Sticks & Stones Productions - Statues that come to life and perform elegant acrobatics and acrobalancing to amaze your guests. Available all over the UK for Weddings, Hotels, Private Parties, Corporate Events.